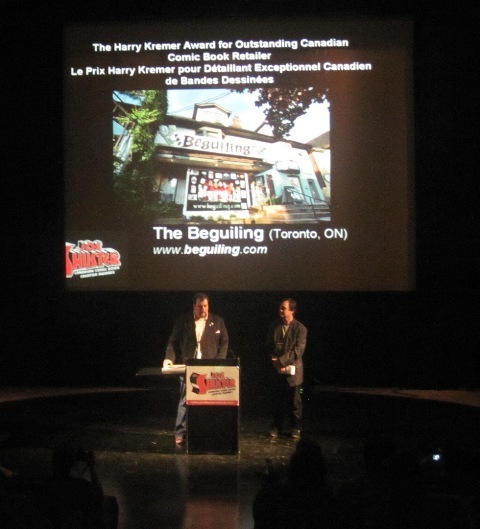 Photo: Store manager Chris Butcher accepting the 2010 Kremer Award on behalf of his store The Beguiling in June 2010. Who will make the short list in 2011? You can help us decide by pointing out the outstanding comic book retailer in your area! As we enter December it is time to give some thought and consider which comic shop retailer did an outstanding job in 2010 and is worthy of recognition for the Harry Kremer Award. Do you believe your local retailer deserves to be recognized alongside the top comic retailers in Canada? Send us an email and provide us with some information as to why you believe that store deserves recognition. All nominees will be considered by the Awards Association Executive. Nominated stores will be contacted to provide further information, as well the shops will be researched, through use of secret shoppers, to determine how well they meet the award criteria. The judges of this award, aware of the award criteria, are given the freedom to determine their own preferences within the criteria (perhaps they feel that back issues are the most vital component of a comic book store) and grade the shops accordingly. Total points scoring, as well as debate amongst the judges, determines the final winner. Knowledge. Comic retailing is a broad and diverse business which requires specialized knowledge. It’s important to stay informed of modern retailing practices as well as building product knowledge. what distributors do you use? are you a member of any outside organizations? what events / conventions / seminars have you attended? have you written articles or scholarly papers about comics? were you interviewed in the press? Community activity. Expanding the reach of comics is key to the growth of the market. Promoting comics to the community, building and maintaining relationships with schools and libraries, keeping active in social, business, and arts community organizations are all ways to market your business and help you stand out as a community leader. what advertising have you used? what in-store events have you hosted? what charities have you worked with? what is your level of community outreach? Adherence to standard ethical business practices. Judges discretion is given here, but this would cover minor things like racking new-release ‘hot’ comics at cover price rather than marking them up, or major things, like staying off the crime blotter. Other issues, such as market competition and tactics used in growing or maintaining market share may be considered.